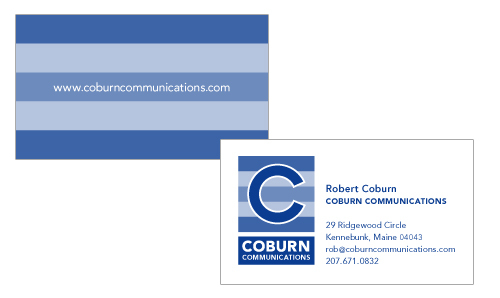 Coburn Communications is a Maine-based PR company. The company previously had a logo with a nautical flag feel, but it needed updating. This logo design harkens to the nautical traditions of Maine with the striped flag similar to the “C” flag used on boats. New business card were also designed by Visible Logic with the updated logo. The stripes that are in the background of the logo create a full bleed graphic on the back of the cards.